One of my childhood favourite 'afternoon delite'!!! 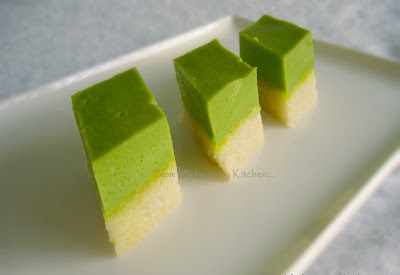 Kuih Seri Muka ....as for the Northerners ... it's known as Pulut Sekaya! 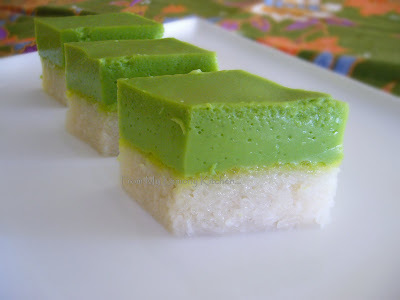 blend the pandan leaves with water and extract the juice. RASANYA MACAM PELIK SIKIT KAT BAHAN SIRAPNYA, 150GM GULA + 100ML GULA JUGA? sorry.. sebab mengelirukan... and terimakasih to point out.. I dah betulkan... suppose to be 100ml water.. 'typo error'..
how do you get the top to be green without pandan water or juice? Tq sis.. i dah cuba this rspi.. sangat sedapppp n tq for sharing..